Former Wells Fargo Employees Describe Toxic Sales Culture, Even At HQ Wells Fargo workers blame a toxic high-pressure sales culture for pushing some workers to engage in deceptive practices — even in the bank branch at the company's headquarters in San Francisco. The entrance to Wells Fargo Headquarters on California Street in San Francisco. 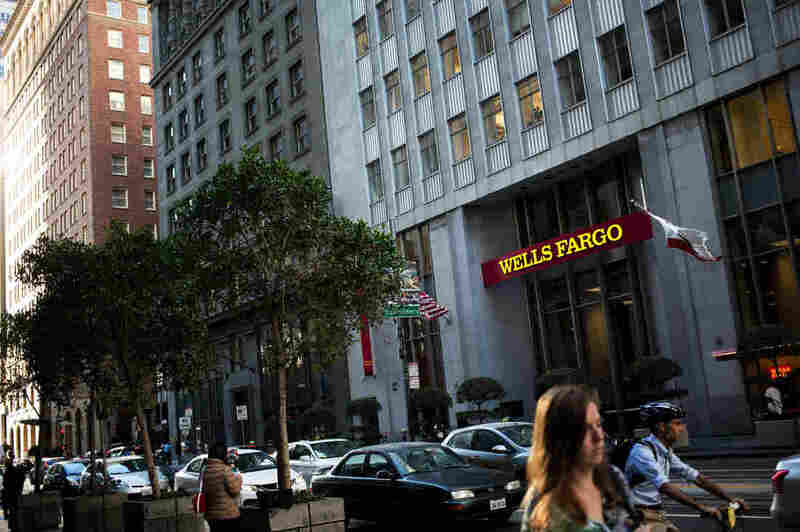 Former employees of Wells Fargo tell NPR that a toxic high-pressure sales culture at the bank drove some workers to deceive customers and open unauthorized accounts — even in the bank's own headquarters building in San Francisco. Wells Fargo is embroiled in a scandal for taking advantage of customers by opening as many as 2 million accounts without their consent. 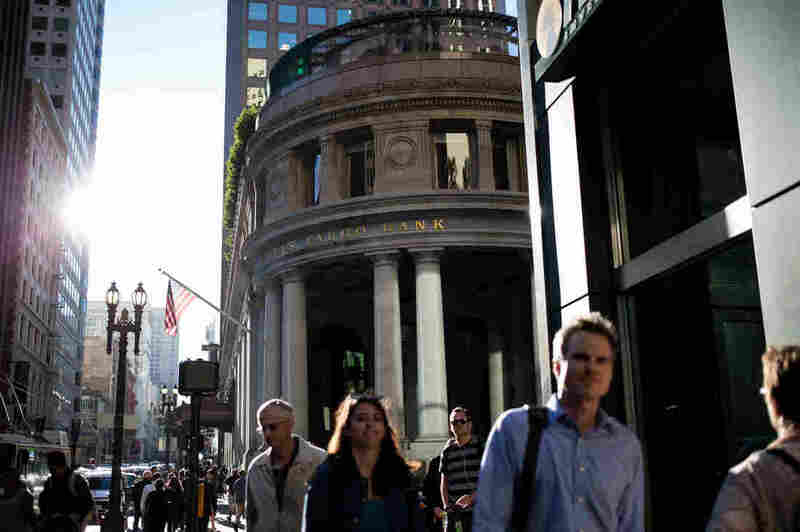 The bank fired 5,300 mostly lower-level workers over the wrongdoing. But Wells Fargo says those workers represent a tiny fraction of employees. The bank basically says they were bad apples who have been fired and who are not representative of the broader culture and practices at the company. In a rare look inside the bank, former workers tell NPR that wrongdoing was widespread even in the bank branch in the very building where the CEO and senior management team worked. Wells Fargo CEO John Stumpf testifies on Capitol Hill in Washington on Sept. 29 before the House Financial Services Committee investigating Wells Fargo's opening of unauthorized customer accounts. 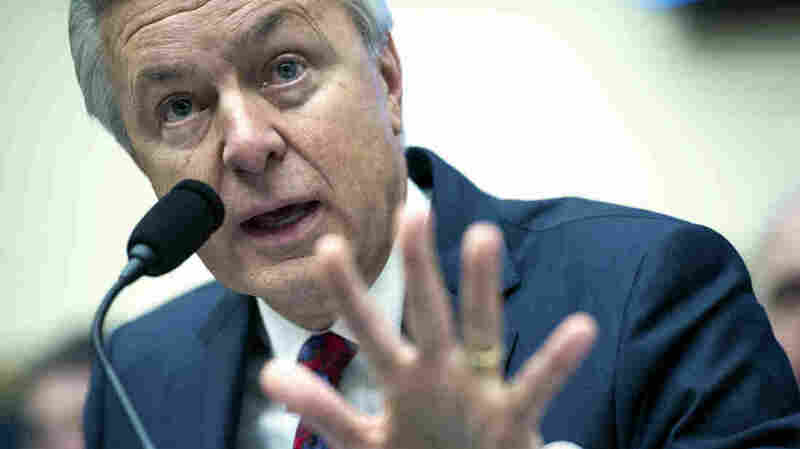 Wells Fargo's embattled CEO John Stumpf has been spending long hours defending himself in congressional hearings trying to explain the scandal engulfing at his bank. "Wrongful sales practice behavior," Stumpf told the Senate banking committee, "goes against everything regarding our core principals, our ethics and our culture." Stumpf says the bank never directed nor wanted employees to provide products and services to customers that they did not want. But former Wells Fargo employees have been watching that testimony — and the ones we spoke to say, in no uncertain terms, they aren't buying it. "Bulls***," says one former employee who we'll call Worker #1. She doesn't want to use her name for fear that talking to NPR will prevent her from getting a job at another bank. She says Stumpf is not describing the Wells Fargo she worked at for 5 years. "That's the whole foundation of Wells Fargo is cross-sell, cross-sell, cross sell," she says, referring to the bank's sales approach of offering customers with, for example, a checking account many other types of products too — credit cards, home loans, lines of credit, etc. Of course, there's nothing wrong with that in principle. But Worker #1 says in practice Wells Fargo pushed it beyond reason. "Everybody needs a ridiculous amount of products," she says. And the sales culture was so intense she says that some workers even in the headquarters and other San Francisco branches resorted to deceptive practices to make their sales goals. "That completely contradicts what he's saying." This employee is upset about what the bank did and how she was treated. But it didn't start out that way. Standing on the street last week looking up at the corporate headquarters building, she remembers back in 2007, showing up for her first day of work at the branch here. She says she was excited and a little overdressed. She was wearing stiletto heels. "I probably had about a pound of hair spray in my hair," she says. "I felt proud and my parents were proud of me for getting a job at headquarters. I was very hopeful." Worker #1 hadn't even finished college yet, so this seemed like a big break. But right away, she said working as a "personal banker" in the branch here was not what she expected. She says the number of products she was expected to sell — checking and savings accounts, credit cards — seemed really high: at least eight products a day. Sometimes it was even more. During a sales push called "Jump into January" former employees say they were expected to sell 20 products a day. That just seemed impossible to Worker #1, and she says the pressure on her and her co-workers to sell was disturbingly intense. "We were all miserable, and it was just soul crushing to walk in every day." Erik, who also worked at the headquarters branch and only wants to use his first name, describes the sales pressure this way: "It was every day, man. It was literally every day. It was a grind-house." Erik says mornings started with a huddle where managers pressed workers to meet their "solutions goals." Each credit card or home equity loan or other product was called a solution. And all day long workers were told to sell solutions, sell solutions. "It was multiple occasions where I saw my co-workers were cracking under the pressure," Erik says. "Tears, crying, constantly getting pulled into the back room having one-on-ones for coaching sessions." Erik says, "You know, there was a lot of coaching happening," and he winks. Why the wink? Erik is a big strong looking guy. He played sports all through college. He says this wasn't really "coaching." Managers called it that, but it was just leaning on employees to sell more solutions. Erik says if you didn't meet your sales goals, that's when employees would have to have these so-called coaching sessions. Employee #1 remembers two managers would approach her desk, reprimand her, and march her past her colleagues. "It's like being called into the principal's office," she says. "Sit down at the large conference table, no windows in this room, they shut the door, lock the door." Then she says managers would give her a "formal warning" and tell her to sign it. And she says they'd tell her, "If you don't meet your solutions you're not a team player. If you're bringing down the team then you will be fired and it will be on your permanent record." She said she was in her early 20s, like many of the lower level sales people in the office. She says she was afraid to lose her job, especially because this started back when the economy was still in bad shape. "You were stuck and it was the feeling that no other employer is going to want you because we will ruin you." Employee #1 says after one of these coaching sessions she threw up in the wastebasket under her desk. Erik compared the job to being in an abusive relationship. A former branch manager we spoke with in the downtown area said he didn't think many managers would be so specific as to outright threaten people with their jobs. Another former worker said his managers would try to be nice about the warnings. But both said that basic message, that your job was on the line, would be conveyed. The sales culture at Wells Fargo helped the bank's bottom line. Wells Fargo expanded the number of products it sold to millions of customers and from 2006 to 2015 the banks stock rose 67 percent. It has since fallen, after news of the banking scandal broke. NPR spoke with former employees who worked at Wells Fargo in San Francisco between the years 2004 and 2011. And they all said a pressure-cooker sales environment at the bank pushed some of their co-workers to deceive customers. Erik says no managers directly told him to do anything deceptive with customers. He says they'd ask him: "Where are you at?' What you got going? How are you gonna get there?" And then repeat, "How are you gonna get there?" And Erik says as long as you hit your numbers nobody asked any questions. Pat, who also just wants to use his first name, remembers one co-worker issuing lines of credit for customers who never applied for them. "There was this banker who — he had this unbelievable loan volume and I was thinking, wow, is he that good of a sales person?" But Pat says he figured out what was happening after customers started showing up at the branch to complain. They had applied for a home equity loan. That was OK.
"But then they also have a personal line of credit for like $20,000 that they didn't ask for. So then I realized how he was doing all his loans, because he was basically tagging on other loan products in the same application so they wouldn't really notice when they signed the documents." Regulators say deceptive practices like this at Wells Fargo were illegal, though in its $185 million settlement last month the bank did not admit wrongdoing. NPR spoke with former employees who worked at Wells Fargo between 2004 and 2011. They said deceptive practices were widespread. Accounts were being opened without customers' knowledge. And they said managers knew. Wells Fargo says this wasn't the culture of the company. But these workers were not in some backwater branch, they were in the branch on the first floor of the headquarters building where the CEO himself and the senior management team worked just upstairs. We contacted Wells Fargo to ask about all this. "Although the vast majority of our team members do the right thing, every day, on behalf of our customers, these allegations and accusations are very serious. And if any of these things transpired, it's distressing and it's not who Wells Fargo is. Our Board announced last week that it will lead an internal investigation into retail banking sales practices and related matters, and we have agreed to other independent reviews as part of our agreements with the City of Los Angeles, the CFPB and the OCC. Our leadership accepts full responsibility for all unethical sales practices in our retail banking business, and fully committed to doing everything possible to fix this issue, strengthen our culture, and take the necessary actions to restore our customers' trust. This includes our decision to end product sales goals for all of our retail bankers, starting this month." When asked whether the bank's decision to end product sales goals was an acknowledgement that the sales culture had gotten out of control at Wells Fargo, Oscar Suris, executive vice president for corporate communications, said, "We felt definitively removing product sales goals would remove a risk that we can't tolerate and remove an area of concern for the public that we feel needs to be removed so we want to take that off the table entirely." As far as what happened to Erik — the big athletic former Wells Fargo banker said after working for the bank for a little more than a year he was having physical reactions to the amount of stress he was under, "upset stomach, nerves, eye-twitching." So his quit his job. "It just got to a point where it was like, I just can't handle this man." Worker #1 says eventually she pushed back and refused to meet the sales goals because, she told her managers, there was no ethical way to do it. She says she called the bank's ethics hotline about that multiple times. She was fired by Wells Fargo in 2011.